In early 2015, the decision was taken to re-roof the Castle Dairy on Wildman Street in Kendal. Whilst the building was being re-roofed, the opportunity arose for some samples to be taken from roof timbers which had, up until this time, been mostly inaccessible. The intention was the the timber samples would then be subjected to tree-ring analysis, better known as dendrochronological sampling and analysis. This process would then hopefully provide some updated evidence as to the dating of the two wings and the central hall. Above. Castle Dairy on Wildman Street in Kendal. Over the course of a few days in April 2015, 18 timber samples were taken from different parts of the roof in both of the wings and the central hall. 14 of the samples were then analysed and found to be suitable for dating. Above. An Anthony Garnett date stone set high up on the wall. Rather surprisingly, the samples clearly showed that both wings and the central hall all date from a similar time period, somewhat going against all previous understanding of the date line of the hall - namely that the central hall was built first with the wings added later during Anthony Garnett's tenure. The date line that the timbers indicated was between 1466 and 1502, 1486 and 1508 and 1486 1507. Broadly speaking, the results point to an early Tudor build date....a period when the Parr family were the holders of the Barony of Kendal and suggest (very strongly) that the Castle Dairy was built as a whole all at the same time. Above. The central hall of the Castle Dairy. 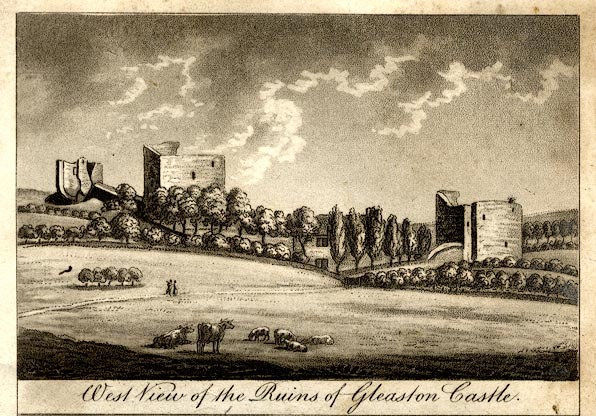 For the Cumbrian Castle Listing's history and description of Gleaston Castle, check this link. 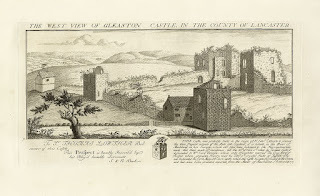 On the 29th of July 2015, I was lucky enough to be invited to join the Castle Studies Trust and the Morecambe Bay Partnership in a very rare open day at Gleaston Castle, situated between Aldingham and Newbiggin on the Cumbrian coast. The Morecambe Bay Partnership successfully made a bid for a grant from the Castle Studies Trust, that would enable them to use aerial drones to survey the castle from the air, providing in depth information about the castle.....a collection of ruined walls and towers that has been slowly decaying and falling into ruin. The state of the standing remains, has meant that the castle has been out of bounds to the general public for decades. Anyone hunting this castle down, or stumbling upon the remains as they walk by, has only been able to take photos from the roadside, a vantage point that provides very limited views of the walls, towers and courtyard. With the invite, came the opportunity to not only enter the courtyard and view the ruins from hither to unseen angles, but also to gain entry to the surviving towers and to survey their fragile interiors. This was really an opportunity that was too good to miss, and the weather was perfect for a collection of photos that ran into the hundreds over the course of two hours. Up close it was clear for the group to see, that many parts of the castle are really in a perilous state. Those parts of the castle that have not already collapsed, are, in some instances, nearing collapse themselves.....money is obviously needed, and in quite large quantities, to rescue this castle from further ruin. Above. The North Western Tower\Keep. Above. The South Western Tower from outside the courtyard. Above. View of the North Western Tower\Keep. Above. View of the South Eastern Tower. Above. View of the ruined North Western Tower\Keep showing the passageways and interior wall walks. Above. External view of the North Western Tower\Keep. Above. Another view of the North Western Tower\Keep. Above. The North Western Tower\Keep and curtain wall. Above. The South Eastern Tower and ruined curtain wall. Above. Interior view of the North Western Tower\Keep. Above. Portion of curtain wall, and possible remains of a ruined tower, at the road side on the Eastern side of the courtyard. Above. Huge crack in the wall of the South Western Tower. The crack in the wall of the South Western tower reaches from the ground up to the surviving height of the tower. It's about a foot deep in places and probably indicates that the Southern wall is slowly moving away from the rest of the structure. It's going to take some serious engineering to stop this movement and stabilise the tower. Above. Entrance into the South Eastern tower. Above. Small window in the South Eastern Tower. Above. Interior view of the South Eastern Tower. Above. Stairway to the first floor of the South Eastern Tower. Above. Draw bar slot in internal wall of the South Eastern Tower. Above. Internal doorway inside the South Eastern Tower. Above. Draw bar slot on the external doorway of the South Eastern Tower. Above. Close up of draw bar slot on external doorway of the South Eastern Tower. Above. Scarring of a removed\demolished wall on the South Western Tower. Above. Close up of the scarring of a removed\demolished wall on the South Western Tower. Above. Stairway to the first floor of the South Western Tower. Above. The interior of the South Eastern tower. The archaeologists present on the day told us the this tower had been re-used at some point, as a dovecote....the many square holes in the walls evidence of the adaptations made at the time. Above, The South Western tower and exit onto the wall walk. The South Western tower still has its arched doorway leading from the first floor of the tower onto what would have been a wall walk at the top of the curtain wall, leading North towards the North Western tower or Keep. Above. The South Western tower and exit onto the wall walk. The wall has been robbed of much stone from its interior face, rendering the wall walk impossible to use now. Above. 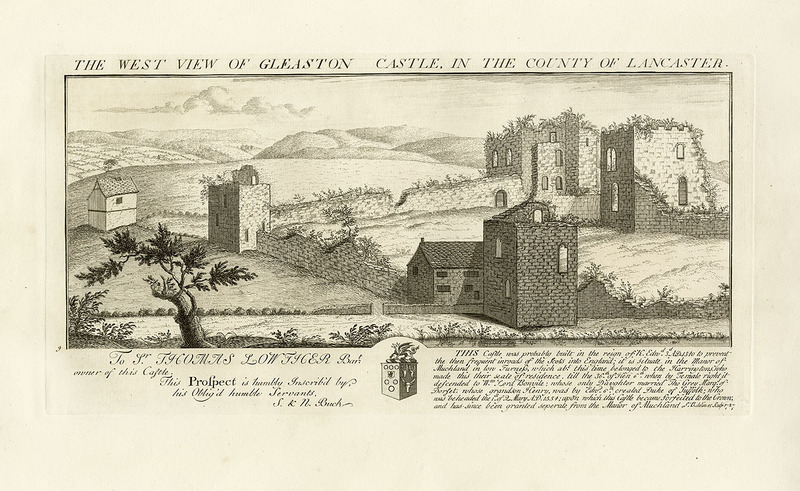 Buck Brothers engraving of Gleaston Castle. "This castle was probably built in the reign of K.Edward 3rd A.D.13 to prevent the then frequent inroads of the Scots into England; it is situate in the Manor of Muchland in low Furness, which about this time belonged to the Harringtons who made this their seate of residence, till the 36th of Hen 6th when by female right it descended to W.m Lord Bonvile; whose only Daughter married Tho. Grey Marq. of Dorset, whose grandson Henry was by Edw. 6th created Duke of Suffolk; who was beheaded the 1 of 2 Mary A.D.1554, upon which this castle became forfeited to the Crown; and has since been granted seperate from the Manor of Muchland." Above. 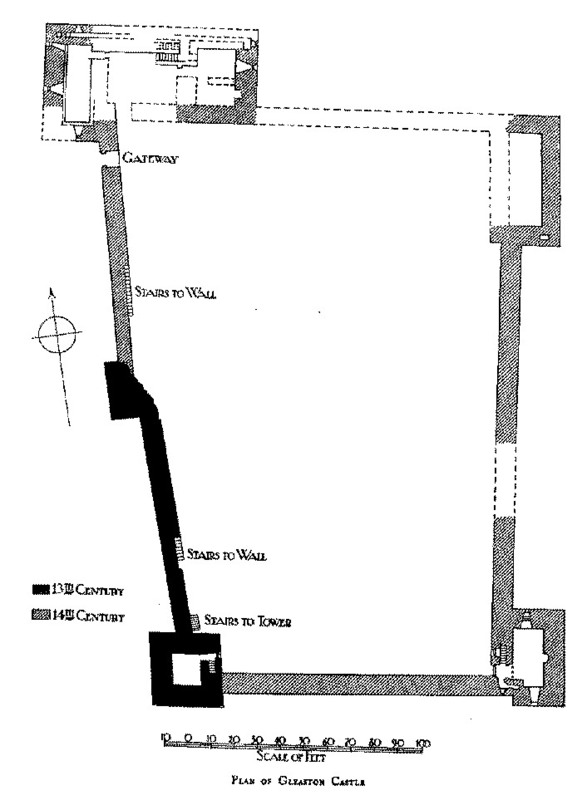 Antiquarian plan of Gleaston Castle. Above. Undated engraving of the ruins at Gleaston. We're still waiting for the full results of the survey, but when it's made available, I'll make sure links are provided on this page. It was brilliant to see this castle again, but the exclusive access to the courtyard to see the towers and walls from new angles made for an interesting visit. To be able to view the interior of the surviving towers and climb to first floor level in two of the was also a great privilege. I was also very excited to be able to add to my collection of draw bar slots.....the examples found in the South Eastern tower were spectacular! !